The art of designing an attractive yard using elements that are not involved in construction is soft landscaping. Included in this are shrubs, trees, potted plants, flowers, and container gardens, as well as hanging baskets. The entire look outside of your MN home can be transformed easily with modifying soft elements. Using methods such as choosing different perennial and annual flowers for your flower beds and pots makes it easier. Foliage plants and flowering varieties have incredible options available. Your choices are almost limitless. You can select perennials that come up year after year with very little care, or you can go for immediate pops of color by planting vibrantly colored annuals each spring; the choice is up to you. There are low ground covers; vines that spread to flow over fences, arbors, and pergolas; compact blooms that stay neat in the middle of a rock garden; and variegated foliage plants that give a soft touch in areas where there isn’t sufficient sun for flowering plants. And you can put them in retaining wall tiers, raised beds, or gardens next to your home’s foundation. Another element included in soft landscaping is the container garden, which can be done as either a free-standing pot or a hanging basket. Geraniums are a great flower to use in hanging baskets. Typically, geraniums last for only one season, allowing for an easy change each year by switching them out. Another element that can be grown in containers is a little ornamental tree. An idea to give your landscape a different feel, would be arranging these container-grown trees to border patios or walkways. This can give visitors a warm, relaxing feeling and it’s a great way to quickly add trees without needing the ground space. When looking for more advanced techniques for soft landscaping, you can add flowering vines. 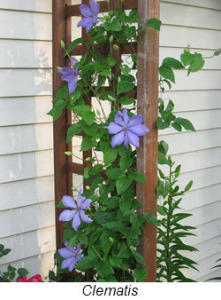 While many vines will grow without much care, several different vines such as the clematis or wisteria can be trained so they will grow around and up garden elements like a trellis or gazebo. The trumpet creeper vine is able to be trained for the purpose of climbing trees or walls. The trumpet creeper is a brightly flowering, fast growing plant that will add a beautiful new element for your garden. After the main structures (or hardscaping) are in position, a creative landscape designer is presented with endless possibilities using soft landscaping. These range from placing ornamental grasses, color, water container features, accent pieces of terracotta, and much more. Creations of structural elements or changing what is done with hard landscaping is more involved than changing soft landscaping, which can be relatively simple. For example, building a deck or installing a patio is more difficult than accenting an outdoor space with container plants. If you’re wanting to change your outdoor living space with soft landscaping, now is the time. Contact us Architectural Landscape Design today to get started! We can provide you with the most beautiful choices that truly make your yard stand out from the others. We want to put your vision and dream to work! We are a licensed MN landscape design and installation contractor, serving the entire Minneapolis metro area, as well as western Wisconsin.